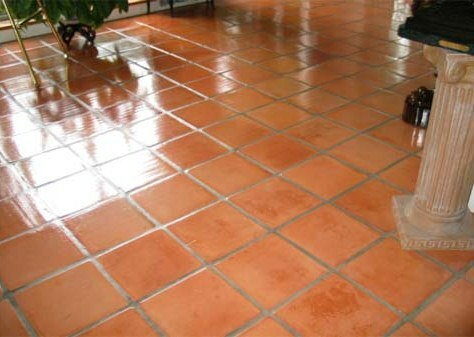 Pictures below of another Terracotta tiled floor that was deep cleaned and then sealed, this time in Whipsnade. You can see from the photograph below the floor was in good physical condition but was looking washed out and had staining to the grout. 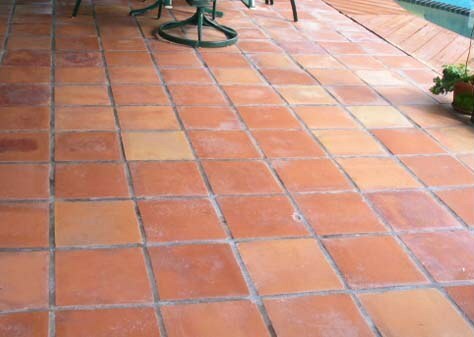 To deep clean the Terracotta tile and grout I applied a strong dilution of Tile Doctor Pro-Clean mixed 50/50 with NanoTech Ultra Clean to produce a heavy duty alkaline cleaner with nano sized abrasive particles that can clean deep into the tile. The resulting solution was left to soak into the Terracotta for 10-20 minutes before being worked in with a Rotovac machine fitted with a Tile and Grout head attachment. The Rotovac is a powerful and versatile tool that can also be used to clean carpet as well as tile and connects to separate machine that feeds high pressure water to the unit as well as generating a vacuum to remove the dirty water back to a separate tank. Once we were happy that the floor we left for the day so the floor could dry. We returned two days later to seal the floor which we did using a combination of two compatible sealers. First off we applied two coats of Tile Doctor Colour Grow which is a premium impregnating sealer that soaks into the tile and brings out the natural colour. Once this was dry five coats for Tile Doctor Seal and Go were applied which is a surface sealer that adds a nice subtle sheen to the floor as well as topping up the stain protection.